When you decide to name and market an item in your line as ‘Mojo’ you better be putting out a pretty good project. To decide that this item is the ‘Mojo’ of your line, is a pretty big deal. I expect good things when this tagline is applied. 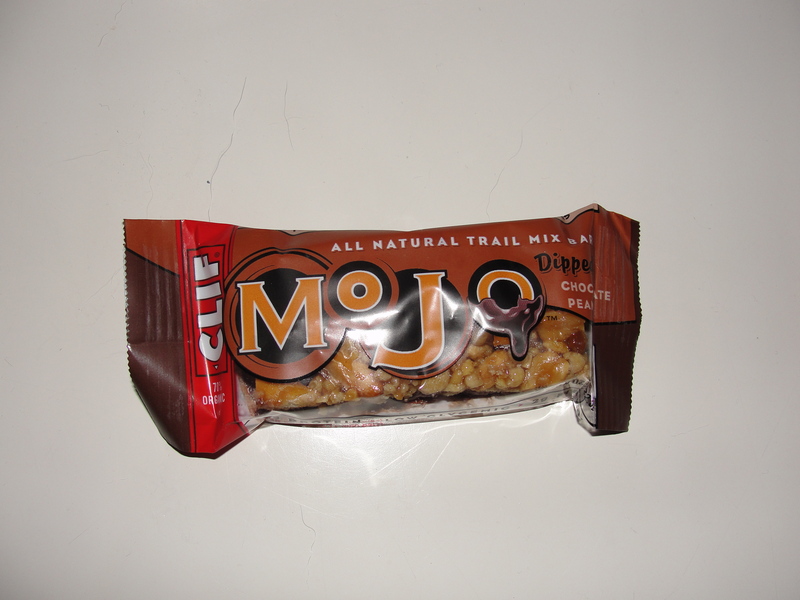 This morning, I tried the Clif Mojo Bar Chocolate Peanut and let’s just say I was not feeling the Mojo at all. There is no way that I would have ever given this bar the Mojo name as it simply just doesn’t have it. I am really not a big Clif bar fan. I haven’t had one in a while and this is just fine by me. I find them to be overpriced, over-calories and under flavor. 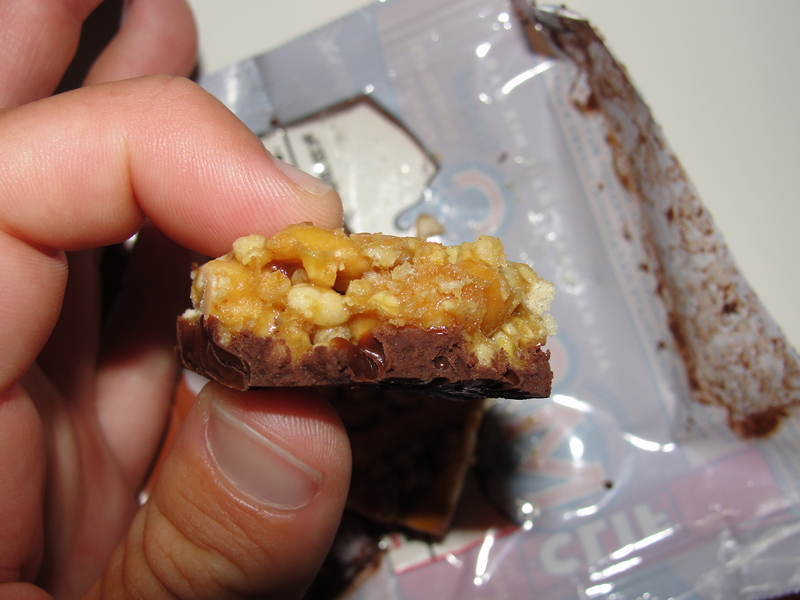 There are so many other bars that produce a better overall product that I simply have no need for the Clif bar. 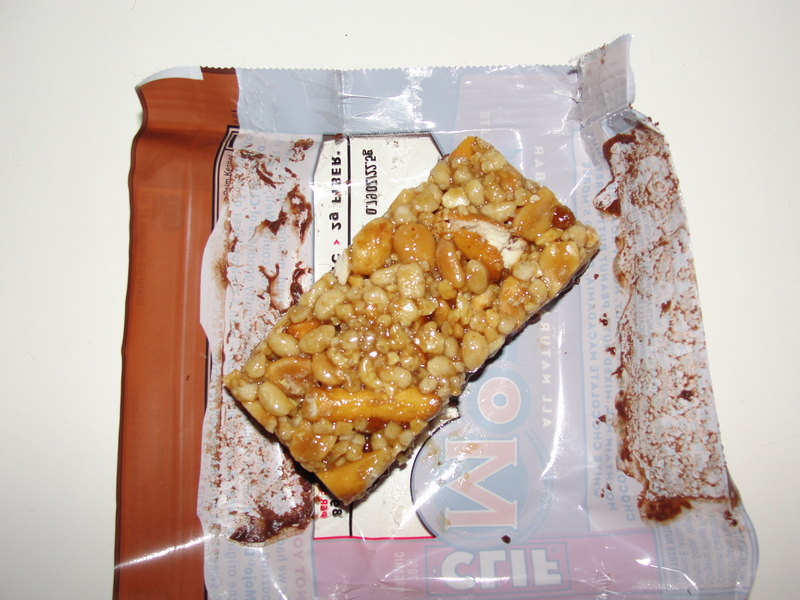 We acquired these bars via the Camp Expo as Taylor brought them home from a sample. At first look of the bar, I thought it must be a sample. This sucker was small. As I was putting them away, I noticed something else. These were expired. By about a month. And someone was giving them away to hundreds of people as a sample. After a bit of chuckling to myself, I decided to save one anyone for means of review since it was only a month expired…I can’t help it…the expired thing runs in the family. I decided that today would be the day I tried this bar. After getting my two morning workouts in, I was starved and needed something to eat before breakfast. I decided to go with the Mojo bar even though it comes in at a whopping 200 calories. Really? 200 Calories for a ‘snack’ bar? This is pretty insane. On a normal day, I eat 3 snacks. Want to know the total calories for all 3 snacks? 129 Calories. Yeah, so 200 is pretty crazy. As I opened this bar, I saw many components to the bar. There appeared to be chunks of granola, peanuts and pretzels. The bottom of the bar was lined with chocolate. I broke the bar into three pieces and placed the first piece in my mouth. The consistency of the bar is what hit me first – before the taste, flavor or anything else. The consistency was odd. It was not crunchy but rather chewy to the point of being manufactured. Does that make any sense? Odd and psedo was the consistency. Also known as Gross and Disgusting. Really, the consistency tasted so fake it astounded me. The flavors could barely brake through the artificial thickness of the strange consistency. What little flavors I did receive were quite muted. Even though the bottom of the bar had chocolate on it, I really couldn’t taste the chocolate. I can’t say whether it was good or bad because I feel as if I don’t have enough to base it off of. And all those crunchy-esq components? Well, the crunch did not exist and there was really no flavor there either. 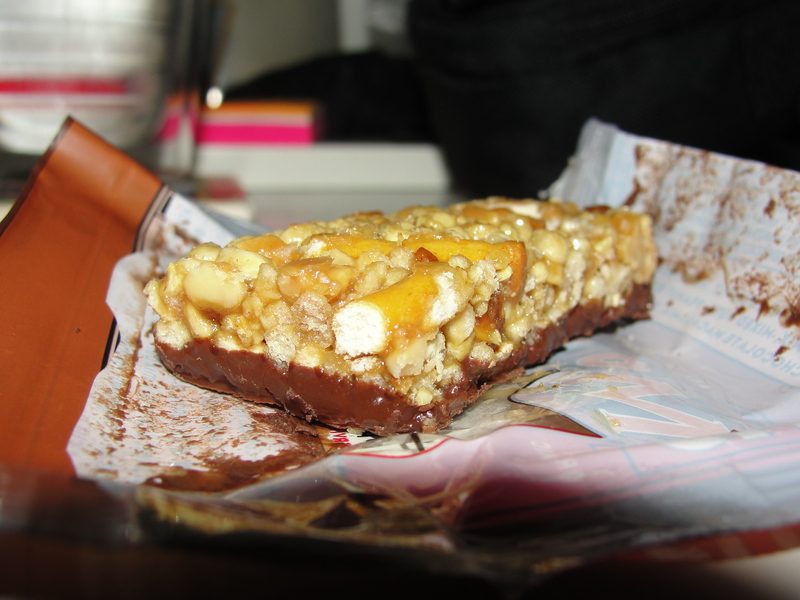 The consistency totally overpowered the taste of the bar. Each and every last bit of it. Now, I am not going to say that the reasons for my disappointment had nothing to do with the fact that this bar was expired because I’m sure it did. Even though the bar was only a month expired, it was probably made a few years ago and has been sitting somewhere for all of this time prior to my eating of it. I’ve had plenty of bars that contain pretzel pieces in them and they are crunchy. Mojo was not crunchy. Not the pretzels. Not the peanuts. Not the granola. Nothing. I consumed this entire bar but I really should have stopped after the first piece. Like I said, this was the first food after two workouts and I was simply just really hungry. I am so glad that I did not pay money for this bar because I would have been even more upset with the horrible outcome of it. 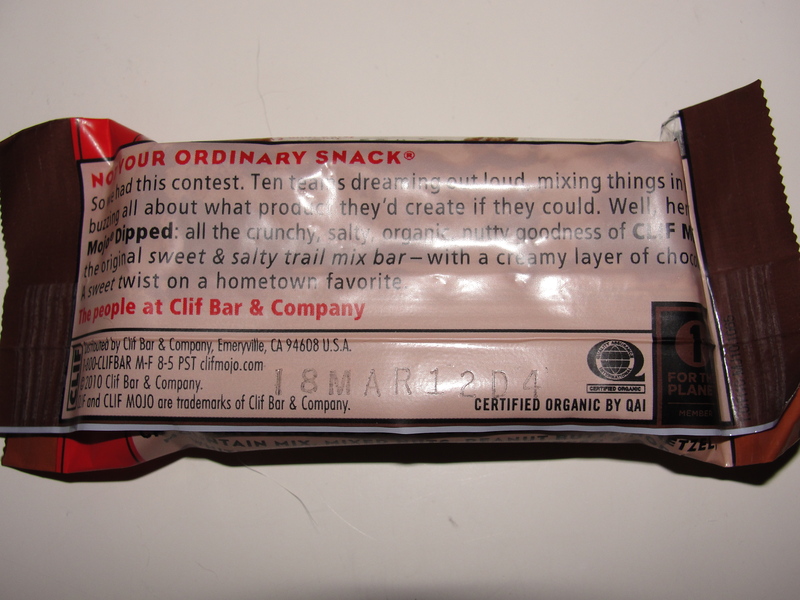 I will never purchase this bar and I think this was the final straw for me on the entire Clif Bar line. Poor product, excessive calories & sugar – equals not for Nicki. The easy answer is, this bar Ain’t Got No Mojo.